UTV Software communications ltd made a huge purchase – 51% stake in Indiagames, a mobile gaming company and also a 70% stake in UK’s Ignition entertainment, an online gaming company. More details on Indiagames financial past on Contentsutra. Writing and exporting games from India still seems to be a very serious proposition. What does the UTV acquisition mean? It’s a large deal. What we are trying to do is to create a large gaming entity out of India. The acquisition of Ignition brings in the console gaming capability. We bring in the online and mobile gaming capability. It’s also a sign that how serious gaming business is becoming. UTV is launching a channel for youth, and from that perspective their investment in Indiagames is very strategic. UTV is also very strong in bollywood space, and they are going to help us a lot on creating great content. They understand the broadcast technology and the youth market. So there is a lot of synergy. UTV also has a very large animation business. Adding Indiagames and Ignition to this portfolio, it gives a complete picture of growing a very large company in gaming. And UTV is known for delivering shareholder value. For the people of Mumbai. Originally uploaded by virgorama. India paid tribute today to those hurt or killed in the attack on Mumbai. 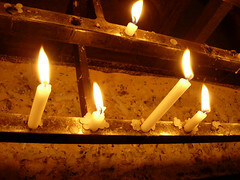 You can join in too, wherever you are – light a candle on CNN-IBN. For every candle, Re 1/- will be donated to a blast victim. Too bad the Summer’s over! Along the gulf coast U.S.A a crisis is brewing. There are easily thousands of people stranded on the highways leaving Houston, Texas. They are directly in the path of incoming Hurricane Rita. In other words, they just walked into a situation that could prove fatal. I wonder, what are they going to do now? People stranded on a highway, versus people secure in a basement or some other solid structure – what is worse? I wish the evacuation which is very necessary, was considerably more efficient. As if the humanitarian disaster that followed Hurrican Katrina wasn’t bad enough. Makes me wonder, how well prepared is the greater Seattle-area? Of the many natural disasters that can hit the area, Volcanic eruption, earthquakes, and a massive Tsunami are the notable ones. Even In the case of an impending disaster with plenty of advance warning, I am pretty sure Interstate-90 and Interstate-5 would be clogged within a day of an announcement to evacuate. Everyone would probably have the same idea – lets hit the highway and get out of town. Question remains, how would you evacuate a metropolitan area or a large city? Is that even a feasible proposition? What would you advise someone to do in case they find themselves in that position? Seattle hailed for disaster readiness [SF Gate]. In Baton Rouge, La., Gov. Kathleen Babineaux Blanco called for the evacuation of a nearly half a million people in the southwest portion of her state. Mr. Coleman’s family had tried to leave the city Thursday at his urging – he is traveling on the West Coast – but they gave up after 12 hours of stalled traffic, without even passing the city’s outer ring highway. A high-occupancy vehicle lane went unused, he said, and they saw no police officers. At one point, Mr. Adcock said, he called the Texas Department of Transportation for an alternate route, but the woman who answered could not find a map. Frank E. Gutierrez, the emergency management coordinator for Harris County, said that models for an emergency evacuation envisioned 800,000 to 1.2 million people but that “well over 2.5 million” hit the road to flee Hurricane Rita. Earlier, as the crush worsened, state transportation officials announced that contraflow lanes would be established first on I-45, then 290 and lastly on I-10. But by midafternoon, with traffic immobile on 290, the plan for extra lanes there was dropped, stranding many and prompting other to reverse course. “We need that route so resources can still get into the city,” said a transportation spokeswoman, Janelle Gbur. “I just talked with the governor this morning and that was his No. 1 request is to make sure we can get some fuel down there, to make sure those cars have fuels, make sure the first responders have fuels, and we are working to process that right now,” said R. David Paulison, acting director of the Federal Emergency Management Agency. For people stuck in traffic trying to evacuate, Mr. Paulison advised them not to turn around and go home. The shaking under Mount St. Helens climbed another notch yesterday, and geologists quantified the odds that the Cascades’ most active volcano would let loose again. “We’re saying there’s a 70 percent chance of an eruption within the next few days to a few months,” said volcanologist Cynthia Gardner of the U.S. Geological Survey’s (USGS) Cascades Volcano Observatory. This is starting to get worrying, there is an arsonist loose in Seattle. Everyone seems to agree that this guy is a professional. May you live in Interesting Times – Ancient Chinese Curse. More about the origin of the phrase above.